I’m always thinking about food. In fact, you could say I’m obsessed with food. For a woman who’s struggled with weight issues all her life, this doesn’t seem like a good thing. But when your body reacts negatively to wheat and soy and corn and dairy products, you can’t help but think about every morsel that passes through your lips. My health depends on it. A recent week-long trip alerted me to how food obsessed I’ve become. Before I could even step through the airport doors, I planned what to pack in my lunchbox that would pass TSA inspection. (Last trip, they confiscated my almond yogurt and peanut butter!) Then, the entire time I was away from home, I had to constantly think about what the host was serving and how she was preparing the food. No, I can’t eat a croissant with butter or that sausage that isn’t labeled gluten free. And by the way, could you not serve the fruit on the same plate as the rolls? I didn’t look this happy when I was grocery shopping for food allergy food! Before I finished breakfast, I was already planning lunch and dinner. If we were eating out, I jumped online and researched the restaurants through apps like AllergyEats. I followed up with a call to the staff to review my allergies. Sometimes plans were changed. If eating in, I had to negotiate a meal that included something allergy free for me to eat. Of course, it isn’t just when I’m travelling that I’m thinking about food. 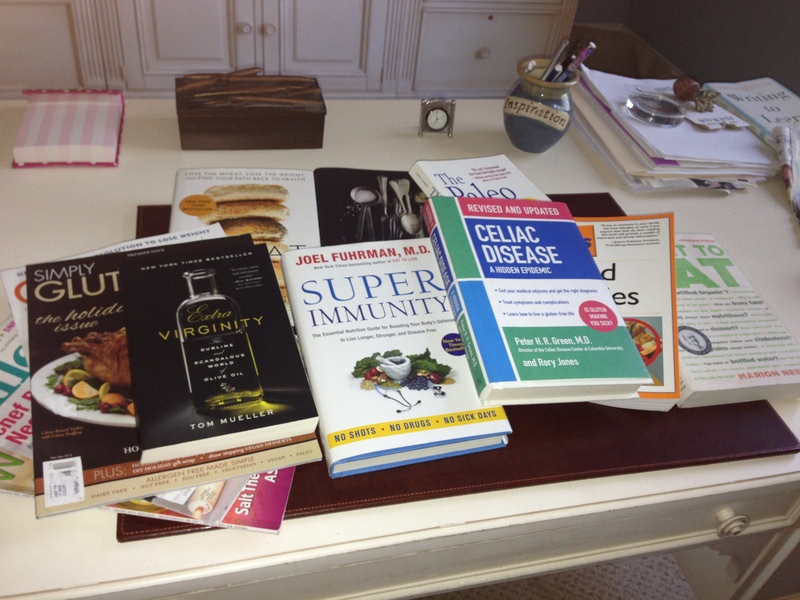 My desk is covered with books and magazines and articles related to food and health and cooking. I can never just read one book at a time. Every morning I read blogs and tweets about celiac disease and food allergies. I belong to multiple support groups and organizations. I try to stay up on the latest news about CD, leaky gut, and eosinophilic esophagitis. I keep this blog and associated Facebook and Twitter and Pinterest accounts. 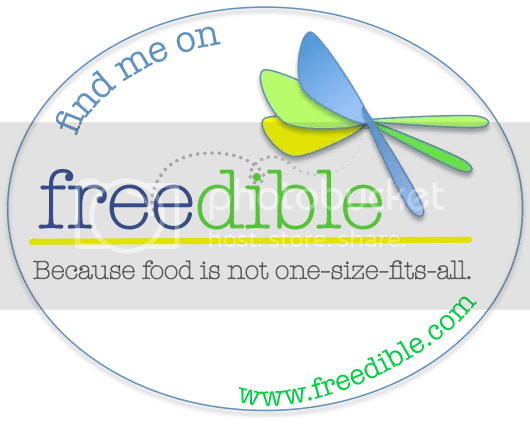 I write reviews of cookbooks and restaurants and test food and products designed for allergic foodies like me. I guess you could say food has become my passion as well as obsession. I love meeting other allergic foodies! Please “friend” me on Facebook and Pinterest and Twitter–I’ll reciprocate! Forgot to mention that I am also following you on Pinterest. And who wouldn’t be obsessed if they had to constantly worry about the food put in their mouths for fear of a reaction. I am a food lover too! Yeah there is some things we cant eat because of our allergies, but that doesn’t hold me back! Good for you!